In May of 1996, God made sure that we rented a house directly across the street from Kem and his wife, Pao. Their eight children were among the first to come to our children’s program. A year later, Kem and Pao became the first couple to receive Christ and be baptized into our church. Today, Kem pastors the church that he helped me start in the village of Jeoung Jap. Since the time Kem was saved, he has zealously tried to win his friends and family to Christ. This led us to visit his home village of Jeoung Jap in Ta Keo Province in 1999. Over one hundred people showed up to listen to the Gospel (I thought). It soon became apparent that all of these people thought I had come to pass out some kind of aid, such as rice or medicine. This is a common problem because so many groups make single trips into villages, hand out “goodies”, preach the Gospel, then leave, never to be seen again. Once the people in this village figured out that I wasn’t there to “help” them ( at least by their terms), they stopped coming to listen to me preach. However, Kem’s mother-in-law had already accepted Christ, stopped going to the Buddhist temple, and became known as “Grandma Jesus”. Kem’s father-in-law was always drunk, and it seemed that we were not getting anywhere with him. After returning from my furlough in 2001, Kem asked me to go see his father-in-law. He was dying, had stopped drinking alcohol, but most importantly, he was telling people that he now believed in Jesus Christ. Sure enough, he had started listening to a Christian radio program and had accepted Christ as his personal Saviour. He soon became known in the village as “Grandpa Jesus”. The other people in the village still had no desire to listen to the Gospel, but then something happened in 2002. “Grandpa Jesus” died. Becky and I went to the village with Kem and Pao as soon as we heard. We knew that his brothers and sisters would not permit us to have a strictly Christian funeral. (They are afraid of their dead relative’s spirit, so they demand to do all of their ceremonies that “appease the spirits”.) As we travelled the 80 km to the village, I prayed that God would give me wisdom and opportunity to tell “Grandpa’s” testimony, proclaim the Gospel, and glorify the name of Jesus Christ. God did just that. In this village, people believe when someone dies, they should go to the deceased person’s house and do things that make a lot of noise. They play loud music and make sure the closest family members stay very busy, so they don’t think about their great loss. They also believe if a loved one is crying too much the spirit of the dead will come “get them” and take them to the land of the dead with them. That said, you can only imagine how surprised and shocked we were to walk into this “funeral”. There were men at tables drinking alcohol and playing cards, neighbor children running all around, and worst of all, “Grandma Jesus” making food and serving tables for all of these “guests”. Becky and I parked our motorcycle and stood in shock. Grandma immediately walked up to me. I held my arms open, and we embraced in a long hug with Becky wrapping her arms around both of us. Grandma just buried her head into my chest and wept. We just held her until she let go. It didn’t take long for people to notice, and everyone fell silent. Grandma sat down with us and a number of villagers circled around to hear what we were saying. She began to tell us how Grandpa died. The people standing around were confirming what she said, “Sir, she’s right. He wasn’t afraid at all. Why wasn’t he afraid to die?” Just before he died, Grandpa even told Grandma in the presence of some neighbors, “I’m going ahead, and you come later.” Grandma said, “I know he is in Heaven and wants me to meet him there.” Praise God! What a great testimony! Because of the loud music I could not be heard by more than the few who were circled around us. People quieted down while I read. When I finished, I looked up, and in amazement realized that everyone there had stood up, drawn closer, and was attentively listening. God spoke to my heart saying, “Here is your chance. Now take it.” I quickly turned to II Corinthans 5 explaining that Grandpa was present with the Lord. The Bible said so, and Grandpa said so before he died. Then I had a chance to explain why Grandpa went to be with the Lord. He believed the Gospel of Jesus Christ. For nearly 30 minutes I had everyone’s undivided attention. Never before had I seen such interest and attentiveness from these people. God was doing something through the life and death of “Grandpa Jesus”. 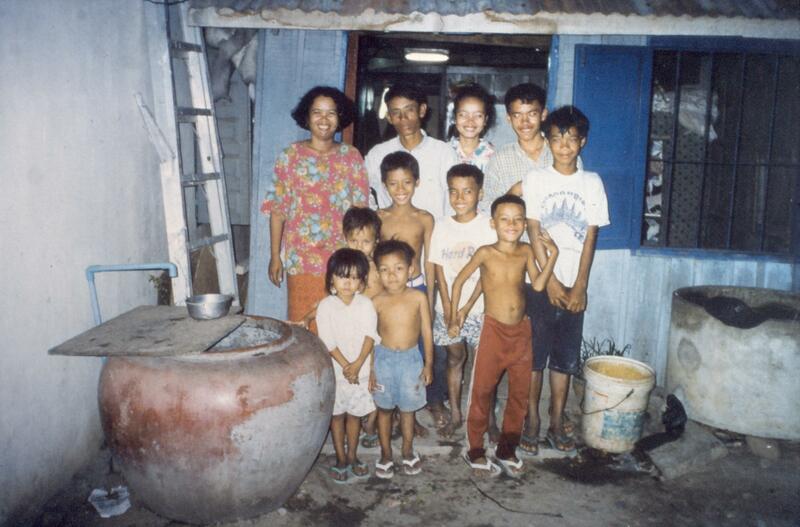 The story of Grandpa Jesus is important because it changed everything in the village of Jeoung Jap. The people there saw first hand that faith in Christ was good for dying. When we first went there, the people hoped for earthly help; rice, money, or medicine. When Grandpa died, some of them could see that spiritual help would have far greater benefits, and so they began asking us to teach them about Jesus Christ. God led me to start going to this village every other week, hold an open meeting, stay the night, make visits, and teach salvation Bible studies to anyone interested. Kem often accompanied me. By the end of 2003 a small number of people had put their faith in Jesus Christ and been baptized. They started asking me to increase our visits to every week. 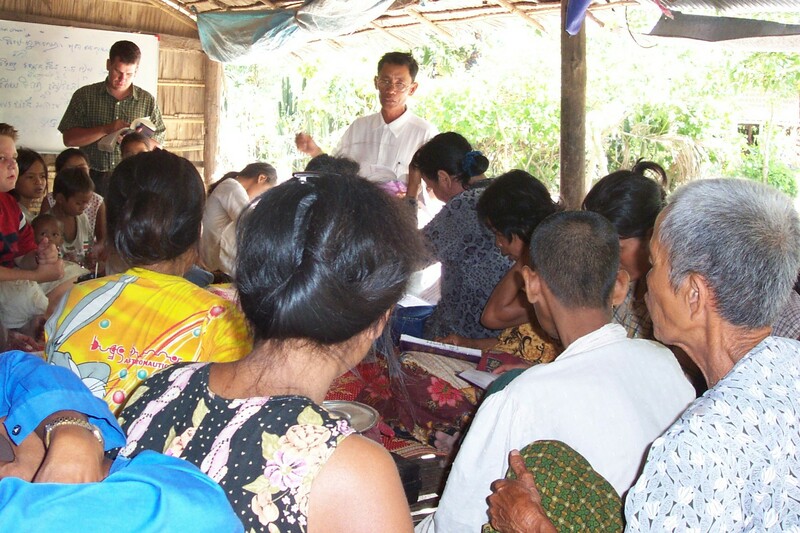 Two other village ministries along with pastoring the church in Phnom Penh were hindering me from doing so. So they asked me if Kem could come teach them every week without me. Kem is poor and loses money every time he takes off work to go to the village, however he still decided by faith to go to his home village every week to preach the Gospel and strengthen the church. 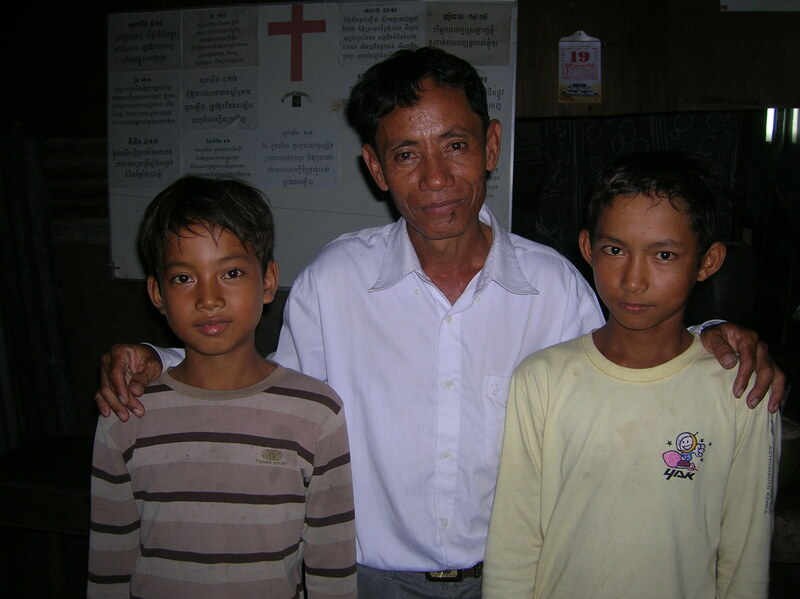 The leaders of New Hope Baptist Church in Phnom Penh prayed together, and in the beginning of 2004, the members of New Hope voted to start supporting Kem in order to enable him to do the work of the ministry in Ta keo Province. 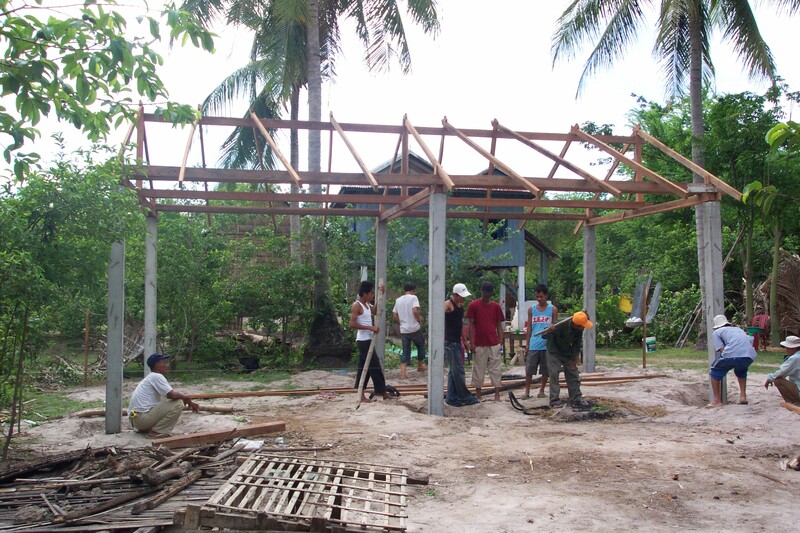 In 2005 New Hope Baptist Church also gave all the funds and provided all the labor to construct a simple meeting place for the church in Jeoung Jap. After attending morning services at New Hope in Phnom Penh, Kem and Pao ride their small motorcycle to Jeoung Jap every Sunday afternoon. Eighty kilometers one way is a dangerous two hour trip when riding a motorcycle on Highway Two. They hold services on Sunday evening, then a number of people come back the same night to have a prayer meeting. On Monday Kem spreads the Gospel in a house-to-house fashion, then teaches the children from the village in the evening. The children and teenagers are really growing into strong young Christians. It is a thrill to see! Please pray for Kem and Pao as they travel every Sunday and Tuesday. As they were travelling back from Jeoung Jap on March 16, 2010, a car, going much too fast, sideswiped their moto. The accident sent Pao skidding down the road on her right leg and the moto sliding down the road while on top of Kem’s leg. The car just kept right on going without any regard to their lives. Thank the Lord that neither one of them sustained serious injury. Your prayers for this family are much appreciated! Not too long after writing the above page, we started to hear rumors of trouble in Kem’s family. His oldest daughter was planning to get married (not pictured aboove), but the groom was not yet a Christian. By the end of April, Kem and Pao had come and asked me to officiate their daughter’s wedding. They knew I could not marry a believer to an unbeliever (II Cor. 6:14). I had to refuse, and Pao immediately stopped coming to church. Kem admitted to me that he knew it was contrary to the Word of God, however by the end of May, Kem had stopped taking support from the church and was also no longer attending church. A few weeks ago, their oldest daughter was married to an unsaved man named Chea. Kem is still travelling to Jeoung Jap Village every week. However, he is doing so without the financial help of New Hope, and, I believe, without the blessing of God. Please continue to pray for Kem’s family. Kem and his wife are bitter. Most of Kem’s children are now disillusioned and dabbling in the things of the world. Two of his sons are still coming to church, but they seem to be discouraged. We are also praying and working at winning Chea to Christ. Kem’s family is special to us as you might know from reading above. He was the longest standing friend I had in Cambodia. He was with us before we could speak the language. He helped us translate to Khmer when we were already speaking Khmer. 🙂 He put his arm around me when I was discouraged. I stood with him and comforted him at a number of funerals. I officiated two of his children’s weddings. We’ve laughed together, cried together, prayed together, and preached together. This situation has broken my heart and I believe his also. Please pray for God to do a great work in both our hearts. Please ask God to help me be filled with His love and compassion. Please ask God to reconcile Kem’s family with Himself and with the church. Please pray that the name of Christ would not be hurt any further by this ordeal. This is one of the most awesome missionary stories I have ever heard. The funny thing is, I’ve heard it before, been to this village, and know Kem and his family, but it still thrilled my heart to read their story again! Thank you for sharing it! What a gripping and challenging story. I will read this to my Single’s Sunday School class this Sunday. Thanks for sharing the blessing, Rodney. Please let Kaem know that we are praying for him and his family and for his ministry there. What a blessing to hear this story again! Carolee Edwards and her Ladies’ Class always ask for your prayer leters to share in class. I’m giving her this entire page. They are prayer warriors and will pray faithfully for you, as will I. The Devil just keeps trying new things. I thought of David and Psalm 41, when Absolom declared war against him when I read this. Keep up the great work. You are doing a wonderful job. Our thoughts and prayers are with you and your ministry. You are an amazing family! Let not your heart be discouraged. You have many other victories to rejoice. Thank you for investing in my sister. Without your assistance, she would not have ever come to know the Lord. 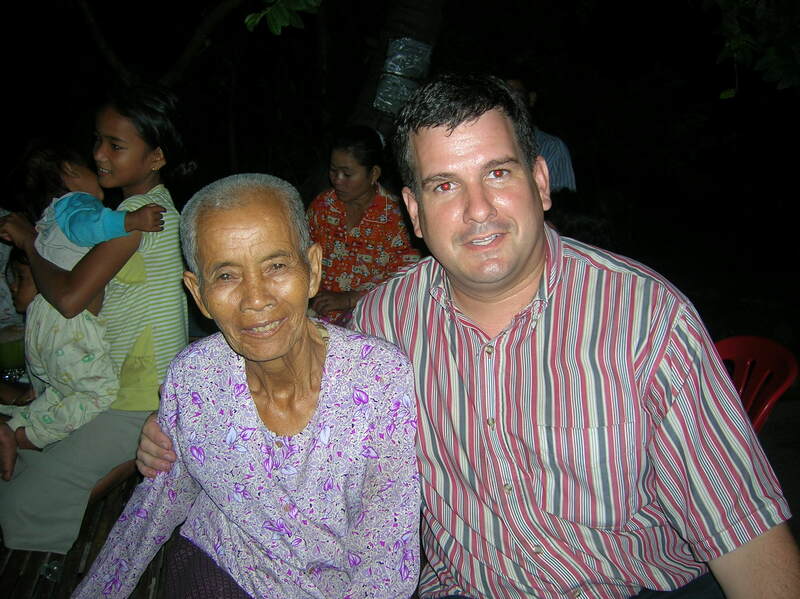 I will always be indebted to your contribution of the furtherance of the Gospel in Cambodia. Cambodia needs you! Just read your story. I will be praying for all of you. And, that Satan will not get the victory through this situation. Thanks Rodney for the “whole story”. Many only picture the glories of int’l outreach. MB and I know specifically how to pray. AND thank God for the great and persistent work you and Becky are doing. My heart was thrilled as I read this amazing, exciting, and eloquent missionary story. 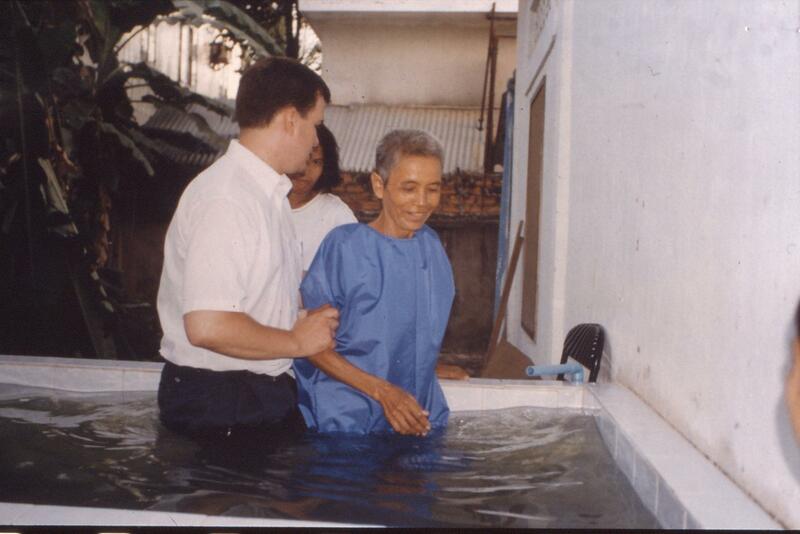 The story of Cambodia missions captured my heart many years ago as I began to know of your family’s ministry there. It also became important to me when one of my own became interested in this land as a ministry. Great victories have already been won there through the power of prayer and God’s blessings on your labors for Him. Why else would the enemy of God’s work so hard to attack and defeat? Great victories are still to come–by the power of the almighty One who sent you there. I will be praying so much for you. Be encouraged in the Lord. Having known Kem and Pao for many years, it saddens me to hear of what has happened. We will be praying that God will convict and bring Kem and his family back to the Lord again. Our prayers are with you during this troublesome time. Keep on keeping on! You are a blessing to us! It saddens our hearts deeply to hear of this. Certainly the devil is doing what he can to destroy people’s lives. We pray for you to have wisdom, strength, and peace throughout this. We also will be praying for Kem, his wife, and family. You are certainly a blessing to us also. I am so sorry to hear of your heartbreak. Shane and I will pray that bitterness will be taken away and God’s peace and joy will come again to both of your families. We love and pray for you daily. I just want to let Ohm Kem, his family and the Ruppels know that I am praying for them as they go through all this. I miss you all very much and hope to see you soon! Now I know exactly how and for what my children will be praying, when we bring your ministry before the throne of God next week: Kem & Pao and their children. Even though it’s been 9 years (!) since I saw your mission field, I’ve held those precious people close to my heart. Will be praying extra-fervently next week!